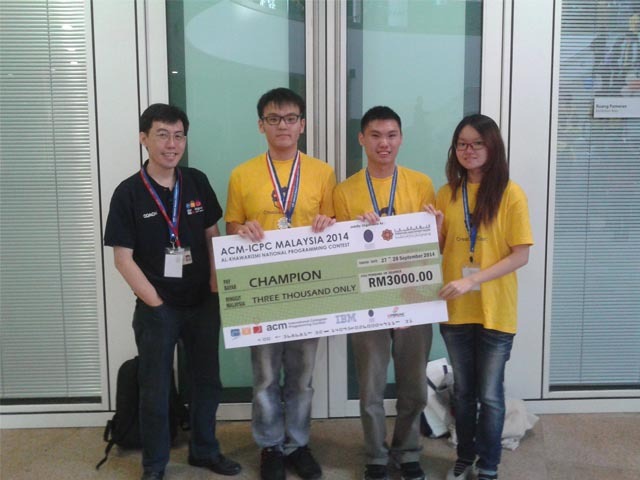 A team of three UTAR students emerged as champion in the Association for Computing Machinery (ACM)-International Collegiate Programming Contest (ICPC) Malaysia National Programming Contest. It was hosted by Universiti Teknologi Petronas in Seri Iskandar, Perak on 27 and 28 September 2014. 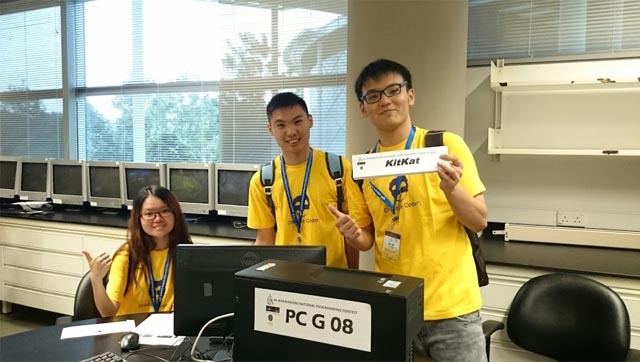 Known as KitKat, the team comprised Lim Yun Kai, a Foundation in Science student, Brenda Lee Mun Yee, a Bachelor of Science (Hons) Computer Science student and Lee Guan Chuan, a Bachelor of Science (Hons) Information Systems Engineering student. Both Brenda and Lee are from the Faculty of Information and Communication Technology (FICT). Team KitKat was mentored by FICT lecturer Dr Ng Yen Kaow, and walked away with a cash prize of RM3000. The team members bagged an individual medal and a certificate of participation each. Trailing team Kitkat was EPSILON from Universiti Malaya and Andalusia from International Islamic University Malaysia, who won the second and third place respectively. In the finals, each team was given 10 problem statements with accompanying data to solve within five hours. They were required to find a solution to the problems by using their knowledge in Mathematics and algorithm to process the data. UTAR team KitKat successfully cracked nine statements, which put them ahead of EPSILON and Andalusia who solved seven and six statements each. “Coaching the previous team was an eye-opening experience for me. I learnt that many participating teams prepared as early as one year ahead of the contest. Last year, our students only had three days to practice but I made sure that the mistake was not repeated again this year,” said Dr Ng, who started to train the winning team three months before the contest. The team occasionally missed training due to their hectic schedules. Nevertheless, they still managed to come out top thanks to the shrewdness of Lim, whom Dr Ng described as a spot-on talent in programming. “Lim played an indispensable role in catapulting the team to their sensational first time victory. Without him, our team would have solved only four statements at most. His talent in programming was evident well before I started to recruit members for the team,” added Dr Ng with gusto. Humbled by the adulation, Lim said that his experience participating in the International Olympiad in Informatics (IOI) gave him the much needed edge in the contest. Last year, he earned a bronze medal in the IOI which is equivalent to a top 150 ranking in the discipline. “The questions that I encountered in the contest were strikingly similar to those in the IOI,” added Lim. When asked about his advice for UTAR students who wish to join the contest, Lim said, “One must have the passion for programming and the willingness to learn. They must also hone their critical thinking and problem solving skills.” An avid fan of programming, Lim has long heard about the contest and wanted to take part in it since schooling days. Meanwhile, Lim’s teammates Brenda and Lee thanked Dr Ng for his invaluable advice and guidance. “To learn with Dr Ng was a pleasurable experience. There was a moment when our scores were tied with EPSILON’s. I am glad that we did not succumb to pressure but regained our lead,” said Brenda. Like Lee, Brenda was far from expecting victory but was overjoyed nonetheless. Despite his indisputable contributions, Lim still mulled over his inability to crack the final statement. “It was the most challenging of all statements and due to time constraints, I was not able to come up with a feasibly good solution,” said Lim. Nevertheless, Lim and his team can still walk tall. Their record-breaking feat is a huge improvement from last year’s sixth place by a UTAR team. Their victory was made sweeter by the fact that unlike most participating universities, UTAR sent only one team but still managed to ace the contest. ACM-ICPC Malaysia National Programming Contest is the Malaysia’s national programming contest that acts as the preliminary round for all Malaysian teams to advance to the Regional Asia Contest. The ACM ICPC is a multitier, team-based, programming competition operating under the auspices of ACM and headquartered at Baylor University. The contest involves a global network of universities hosting national and regional competitions that advance teams to the ACM-ICPC World Finals.